Monday – Friday, 9:00 AM – 18:00 PM, Paris time. 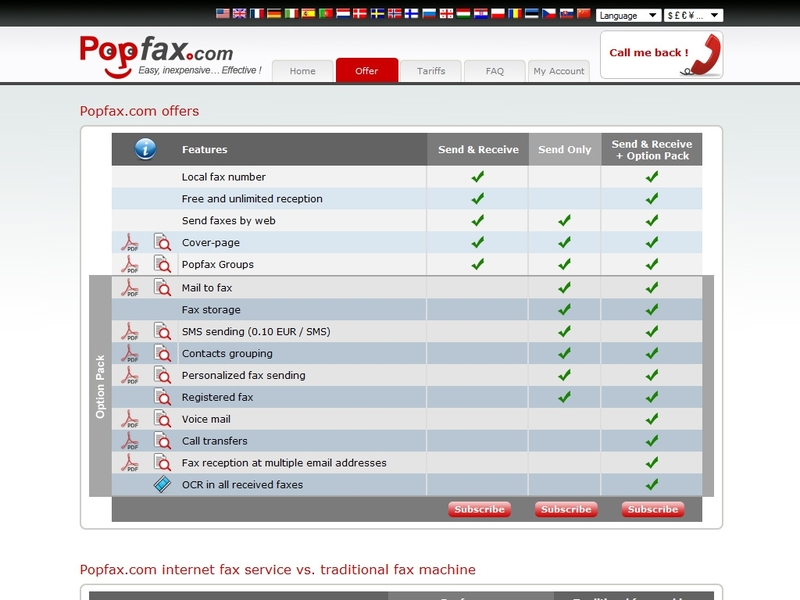 The service is edited by the French incorporated company POPFAX founded by Vladimir Popesco, and has been commercialized, based on a “software as a service” business model, since 2006. It is both a solution for individual professionals (SMEs and SoHos) and for corporate customers who use this outsourced solution to meet their faxing needs. The service has more than 50,000 customers worldwide. It provides local numbers in over 500 cities across more than 20 nations. The web service is supplied in more than 24 languages. Customer support is available in 7 languages. 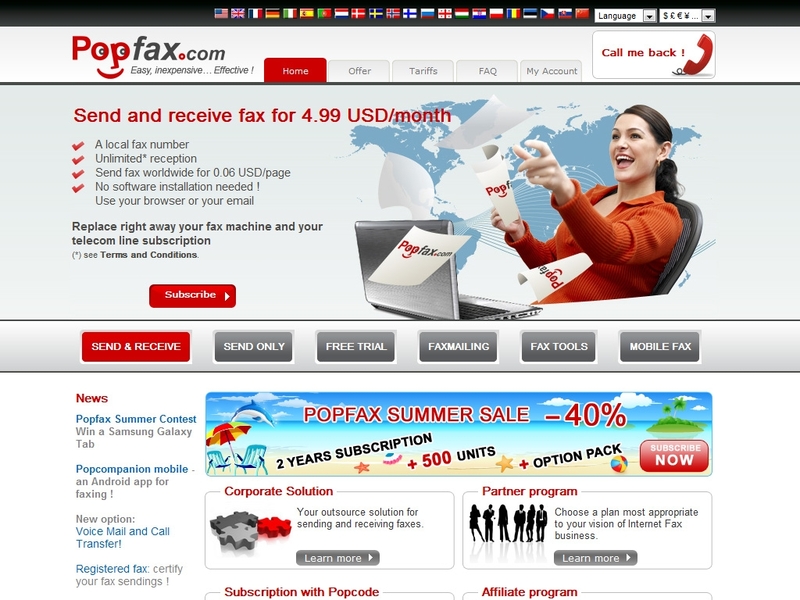 Popfax.com is registered as a trademark in France (INPI registration number 053382225), in Europe (WIPO registration number 0916423, including China and Russia) and in the US (USPTO registration number 3402087). The technical infrastructure of the Popfax.com fax service is based on open standards by ITU (T.2 - T.4, T.30, T.37 (ITU-T_recommendation%29) , T.38). It is also a “cloud computing” architecture because the application intelligence is spread across the internet allowing it to handle high volume usage. Multiple secured interfaces available with the service: Web-fax interface, Mail-to-Fax and Fax-to-Mail (T37) interface, Print-to-Fax interface. Free light PC and Smartphone messenger style applications are available. Built-in OCR enables received faxes to be translated into keywords indexed by local search engine databases. Registered fax (allows both transmission and content transmitted by the two correspondents to serve for legal purposes). Server based and certificate based authentication mechanisms for corporate offers. Voice mail and voice transfer features. Resellers’ back-office to keep track of own clients. Integration tools for operators and corporations who want to design their own fax service based on Popfax.com platform, including front office templates and back-office space for customizing own offers and providing personalized customer care and provisioning. If you use or have used Popfax in the past, please share this page using the buttons above and be sure to leave a rating and review of the service so other people can make an informed buying choice based on your experiences! It's free and you are not required to register! If you have experience with Popfax, we kindly ask that you please share your thoughts with others on this website by submitting an honest, detailed review. Your feedback will help prospective clients decide which service provider to choose and is incredibly valuable to the community itself as well as Popfax's representatives that read this website. Please do not use this form for support inquiries. Be aware that these reviews may also be syndicated and displayed on Popfax's website, and as such a strict review policy is in effect. All reviews are moderated prior to being published, and reviews that do not contain concise, detailed comments or do not support their associated ratings will not be published. We urge you to be as detailed as possible when leaving feedback, as Popfax may also use this information as feedback for their business and are themselves encouraged to reply to reviews posted to their listings. I use fax very often and i have to say that only Popfax.com meets all my requirements. The service is easy to use, reliable, the prices are low, i have the possibility to send faxes to multiple recipients - very important for me and it works via my mobile, great! Excellent service! From the beginning I ported my fax number using Popfax and it was super easy! So now I use only their services when I need to send or receive a fax! Great team! Soy cliente Popfax desde 2013 y estoy toatalmente satisfecho con el servicio. Tengo la libertad de movimiento y ahorro significativo. Gracias por el servicio. I've been with them for over 3 years and they offered me the service I need. I can't say they didn't have bugs or so on, but I use a lot of services online for a lot of purposes and each of them has bugs until they are fixed. I like these guys- they are fast and I can count on them. Thanks for it. Popfax always bring modern solutions for work. I am their client since 2012 and I am satisfied with their service. The call center is very friendly and always pay attention to help you find the solution for your question. I can make other stuff instead of print, scan and send faxes, all of this is possible to make using an digital version of fax. J'aime bien ce service, car il m'aide beaucoup dans mes affaires. Je suis assez souvent dehors du bureau, mais la nécessité de signer et renvoyer un document reçu par fax reste. C'est pourquoi j'utilise les options de Popfax et je suis fidèle. Es bietet anständige Internet-Fax-Dienstleistungen , zusammen mit vielen anderen Messaging-Optionen wie SMS, Voice-Mail, Fax to Mail und andere. Die Preise sind sehr erschwinglich, ich glaube, dass es eines der besten auf dem Markt ist. Was ich shätze ist, dass es ständig weiterentwickelt, mit neuen Optionen, neue Fax-Instrumenten und viele Möglichkeiten zum Senden und Empfangen von Faxen. Es ist sehr flexibel und kann bis einzigartig sein für Ihre Kommunikation gesetzt. Fazit: Wenn Sie eine günstige Online-Fax-Dienstleistung, mit vielen Funktionen enthalten, und unbegrenzte Faxempfang brauchen - Popfax Dienstleistung ist die richtige Wahl. Hello, I am also a Popfax costumer, and I have been with them for almost 2 years. The service is great, I never had problems with send/receive faxes, and recently I downloaded their mobile version on my iPhone. That is all I needed. It keeps me updated on the go. perfect! Hello everyone, my name is Jorge. I work in an agency which deals with Education, Tourism, Proprieties and Translations. 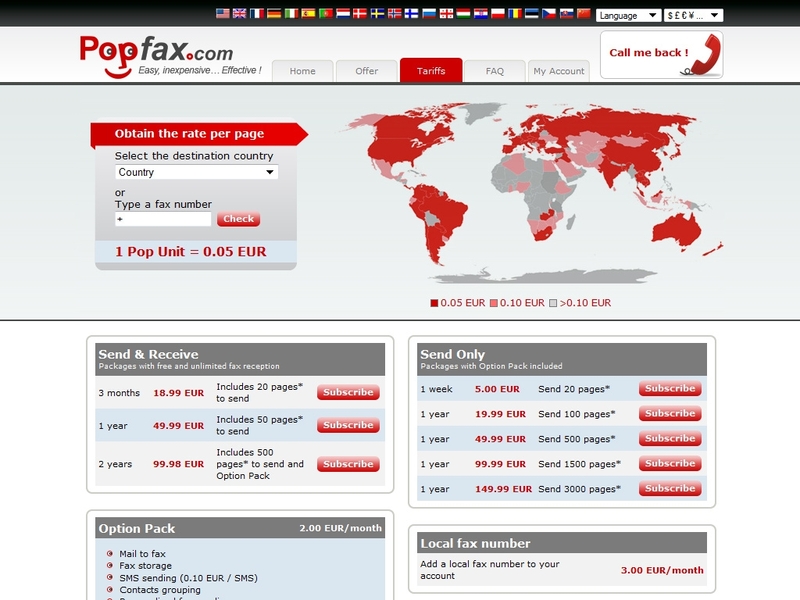 Not long ago we decided to change our way of sending Faxes and we have chosen Popfax. We tried it for free for a couple of days and we really liked it, it is fast, affordable and easy to use. We are satisfied with the choice and I can surely recommend it to the other people as well. By an emergency, we came to Popfax. Changing the provider, we had no Internet FAX more. The numbers of the old society were closed to new. So we were looking for a provider, with the prefix of our city. Since we were customers of Popfax. Review: It has been running since July 2009 without problems and facilitate our business. Disadvantage: It costs a little, but that is acceptable! Ok, let's say from the beginning that I wasn't really using faxes before I met Popfax. It's like it was uncomfortable for me to deal with that big obscure machine I sold long ago. I prefered suffering from not sending a fax than from sending it. But then I got Popfax... really, now I'm sending faxes constantly and I even enjoy it. No toner, no unknown buttons and chrashes - everything is clear and accurate. After trying several of the USA based services and being dissatisfied with their reliability to send to European numbers, I decided to try a local service, and have so far been pleasantly surprised that I have yet to have a problem sending or receiving within the country or even North America! Just shows that sometimes it is better to shop locally! I don't expect to have to change again this is a great, personal service highly recommended! Quick, simple and cheap compared to the fax machine. I recommend to all! I started using Popfax after my old fax machine broke and I couldn't justify the expense of a new machine. The Popfax service is not only cheaper than regular faxing, but also provides several useful services (mobile faxing, etc) that a fax machine cannot. The customer support is very helpful and efficient.